In order to have access to VCAT, a staff needs at least one assignment to students and one access set (except if the staff has been given Full Access). It is the combination of both, assignments and access sets, that give the staff access to VCAT. Without one or the other, access is not granted. Each assignment has a Role associated with it. The role in itself does NOT give access to VCAT but defines the relationship between the staff and the students that staff is assigned to. NOTE : The A tab is only available to Full access users. Under the A tab, clicking on Roles will bring up the list of existing roles for your SU/District with their specifications. This list varies from SU to SU and can be added to when needed. This list can only be edited under the A tab. At this time, the priority is used to order the list. The name of the role defines the relationship between the staff and the students that staff is assigned to. Codes affect the SECT (Student Educator Course Transcript) reports (State reports). ONLY the Teacher of Record, Co-Teacher of Record, and Other Contributing Professional roles should have a respective code of 10, 20, 30. ALL OTHER ROLES SHOULD NOT HAVE ANY CODE. Just like the Code, Subjects are used for the SECT reports. Those Subjects do NOT limit any access to VCAT. They are purely intended for SECT reporting. Text field available if needed. One role can be set to be the default role when manually assigning staff. It'll be the role pre-selected by default when you add an assignment. To set the default role, go to A tab, Roles, click the Edit button in front of the role you want to set as default, click on Make Default under Manual, hit Save. By selecting a role to be set as default also unselects the role previously set as default. One role is set to be the default role used during the assignment import process. You most likely won't ever need to change this one. If you do, it can be changed by going to the A tab, Roles, click the Edit button in front of the role you want to set as default, click on Make Default under Import, hit Save. By selecting a role to be set as default also unselects the role previously set as default. Under the Data tab, editing or adding a staff's assignments will also lists the existing Roles when clicking on the up/down arrow under 'Role' column header. This list can NOT be edited under the Data tab, ONLY under the A tab/Roles. If a new role is needed, go to the How to Create a New Role section to learn more. - Select a role from the existing list. If a role is set with Manual Default, it'll be the default role pre-selected when you manually assign staff. You can select any role from the drop-down list. If the role you need is not listed, it'll have to be created first (under the A tab) before it can be selected. Hit Cancel and return when the role has been created. - Select a different role from the existing list by clicking the up/down arrow. If the role you need is not listed, it'll have to be created first (under the A tab) before it can be selected. Hit Cancel and return when the role has been created. If the role you want isn't listed in the existing roles list, you need to create it before it can be used in any staff assignment. - The Priority number will be filled out by default - this role will be listed at the end. You can leave it as is, or pick a different order number if you wish. 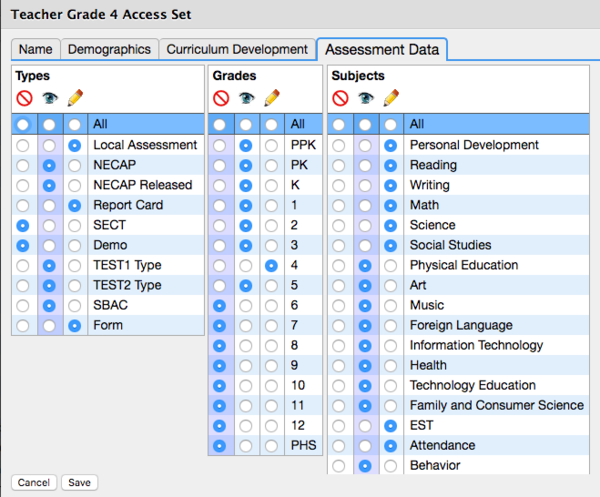 The Access Sets are set up to give (or not) access to Demographics, Curriculum Development, and Assessment Data by TYPE, GRADE, and SUBJECT. Access can be limited to View Only, allow editing, or deny access. Under the A tab, clicking on Access Sets will bring up the list of existing access sets for your SU/District. This list varies from SU to SU and can be added to and adjusted when needed. Clicking on the Edit button in front of an access set will let you see how each of its elements has been set up, as well as allowing you to make any adjustments if necessary. Under the Data tab, editing a staff and clicking on Access Sets will also lists the existing Access Sets. This list can NOT be edited under the Data tab, ONLY under the A tab. A staff account can be edited under the Data tab/Staff List OR under the A tab/Staff. - Hit Save to save your changes. If the access set you want isn't listed in the existing Access Sets list, you need to create it before it can be assigned to a staff. TIP: When creating the new access set, you can go through every element/tab (Name, Demographics, Curriculum Development, Assessment Data) and set them all up BEFORE you hit Save. Clicking on Save gets you out of the edit dialog so, clicking only ONCE at the end will prevent you from having to go back to continue the set up. You can travel from one element to another and click Save at the end to save all the changes you have made in all the elements (tabs). 3. Under Name tab, type in the name and add a description if you'd like (optional). 4. Under Demographics tab, by default, all is set to no access (red circle). Clicking in the All row (blue row at the top) under the eye icon would change the Default to View Only all demographics. If any view access shouldn't be given at all, manually remove them by clicking the radio button under the red circle. If any of them should be editable, manually click on the radio button under the pencil icon column instead. Clicking in the All row (blue row at the top) under the pencil icon would change the Default to Edit all demographics. If any view access shouldn't be given, manually remove them by clicking the radio button for them under the red circle. If any of them should be viewable only, manually click on the radio button under the eye icon column instead. You can also keep the Default under the red circle - which gives NO access to anything, and just manually adjust where access should be given, if at all. 5. Under Curriculum Development tab, by default, all is set to no access (red circle) for TYPES, GRADES, and SUBJECTS. For TYPES, GRADES, and SUBJECTS, you have the ability to set the default access for all to none (red circle), View Only (eye icon), or Edit (pencil), and can also manually set individual ones. For any access to Curriculum Development to even be possible, the access set must be set to give some access to at least one Type, one Grade, and one Subject. Without all three elements, access is NOT possible. Clicking in the All row (blue row at the top) under the eye icon would change the Default to View Only. If any view access shouldn't be given at all, manually remove them by clicking the radio button under the red circle. If any of them should be editable, manually click on the radio button under the pencil icon column instead. Clicking in the All row (blue row at the top) under the pencil icon would change the Default to Edit. If any view access shouldn't be given, manually remove them by clicking the radio button for them under the red circle. If any of them should be viewable only, manually click on the radio button under the eye icon column instead. 6. Under Assessment Data tab, by default, all is set to no access (red circle) for TYPES, GRADES, and SUBJECTS. 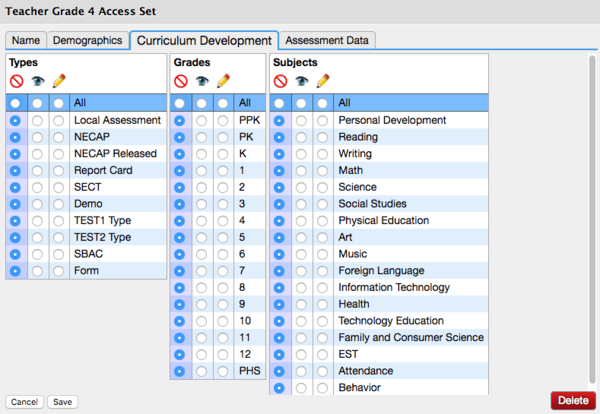 For any access to Assessment Data to even be possible, the access set must be set to give some access to at least one Type, one Grade, and one Subject. Without all three elements, access is NOT possible. Access to Demographics, Curriculum Development, and Assessment Data by TYPE, GRADE, and SUBJECT is defined in every Access Set. Access can be limited to view only, allow editing, or deny access. Access Sets vary from one SU to another. They are built and customized in each SU. Here's a sample (demo) of an access set called 'Teacher Grade 4'. The only purpose of this sample is to help you understand the flexibility you have in how to set up your own access sets. 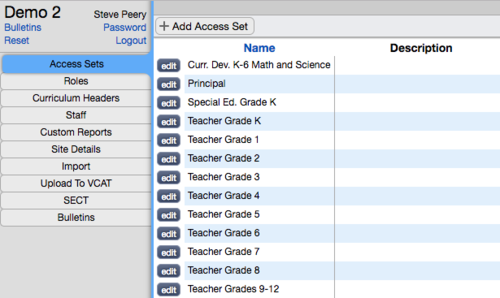 Although in this example, the name is very telling on who would be assigned this access set (Grade 4 teachers or anyone else needing the same kind of access), the name in itself doesn't limit who can be assigned this access set. You could have an access set called 'View Data Only', for example, which would assume that by its set up, this access would give view access to all data for the students the person (staff) is assigned to. Under the eye icon, the background of the whole column is shaded. This indicates that it was set to be the default by clicking in the radio button in the All blue row. This default means that for any new demographics added, this access set will grant view access to them - without having to make any changes to this access set. Access is completely denied (not granted) to all the demographics with their blue radio button under the red crossed circle. Under the pencil icon, there are no radio buttons selected. 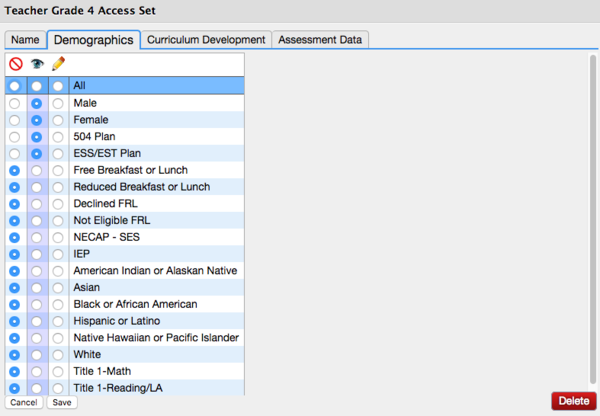 This access set does not give 'edit' access (ability to assign demographics to students) to any demographics. In order to have access to assign students demographics, the staff account would also need to have a check in the Can Edit Accounts box, under the Information Tab. It's the combination of Types, Grades, and Subjects access that determines the level of curriculum development access granted in the access set. The background of the red circle column is shaded. It is actually the default setting. To change the default column, you would click on the radio button in the All blue row at the top of that column. This access set does NOT give any access to curriculum development. A staff with this access only would not have access to the Develop tab at all. It's the combination of Types, Grades, and Subjects access that determines the level of assessment data access granted in the access set. Under the eye icon, the background of the whole column is shaded. This indicates that it was set to be the default. You set a column as the default by clicking on the radio button in the All blue row at the top of the column. This default means that for any new Type of assessment added, this access set will grant view access to it - without having to make any changes to this access set. Access is NOT granted to assessments (curriculum) marked as SECT and Demo types. Edit access is given to assessments (curriculum) marked as Local Assessment, Report Card, and Form types. Types access ONLY (by themselves) would not grant any access. It has to be combined with some Grades and Subjects access. In this sample, the shaded background of the red circle column indicates that the default is set to NO access. View access (eye icon) is granted for previous years (PPK-3), and one year ahead (Grade 5). Edit access (pencil icon) is set to Grade 4, which means assessment data marked as grade 4 and linked to the appropriate groups. Grades access ONLY (by themselves) would not grant any access. It has to be combined with some Types and Subjects access. In this sample, the shaded background in the eye column indicates that it is set as the default. This default means that for any new assessment Subject added, this access set will grant view access to it - without having to make any changes to this access set. Edit access is granted for core subjects, Personal Development, EST, and Attendance. View Only access is given to all Unified Arts subjects and Behavior. Subjects access ONLY (by themselves) would not grant any access. It has to be combined with some Types and Grades access. This page was last modified on 9 February 2018, at 16:55. This page has been accessed 11,225 times.